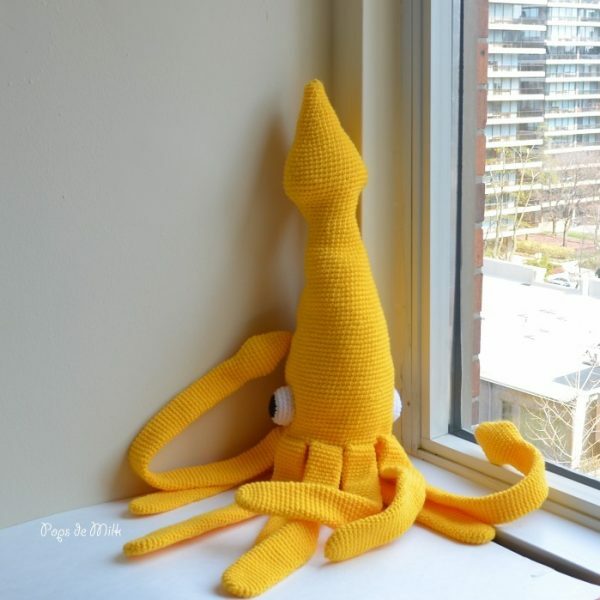 I’ve done my best to make a replica though a much smaller one because to make that same size squid would have taken me a very long time…and I’m sure you don’t want to wait that long. This bright new addition to our squid family measures about 40 inches in length! 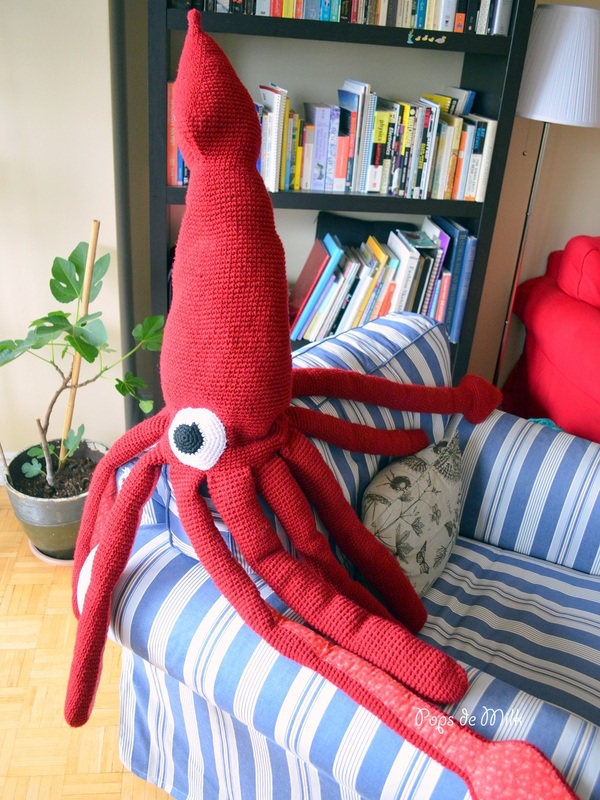 That’s a pretty sizeable squid! And the best part is the pattern is free! Ya! 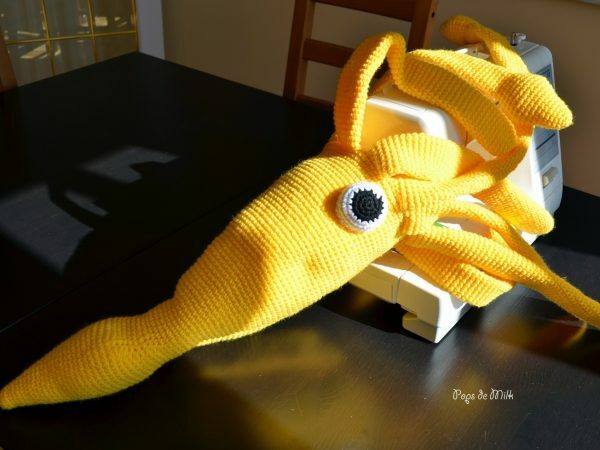 That’s either one hungry squid, or it really loves my sewing machine. And now for the pattern! -Worsted yarn in colour of choice, white, and black. With main colour choice of yarn. Starting from the top. Rnd 1: start 6 sc in magic ring. Rnd 2: inc in each st (12 sts). Rnd 6: inc, sc in next 3 sts, inc, sc, inc, sc in next 3 sts, inc, sc in last st (16 sts). Rnds 7-9: sc in each st.
Rnd 10: inc, sc in next 5 sts, inc, sc, inc, sc in next 5 sts, inc, sc in last st (20 sts). Rnd 12: inc, sc in next 7 sts, inc, sc, inc, sc in next 7 sts, inc, sc in last st (24 sts). Rnd 13: sc in each st.
Rnd 14: inc, sc in next 9 sts, inc, sc, inc, sc in next 9 sts, inc, sc in last st (28 sts). Rnd 15: sc in each st.
Rnd 16: inc, sc in next 11 sts, inc, sc, inc, sc in next 11 sts, inc, sc in last st (32 sts). Rnd 17: sc in each st.
Rnd 18: inc, sc in next 13 sts, inc, sc, inc, sc in next 13 sts, inc, sc in last st (36 sts). Rnd 19: sc in each st.
Rnd 20: inc, sc in next 15 sts, inc, sc, inc, sc in next 15 sts, inc, sc in last st (40 sts). Rnd 21: sc in each st.
Rnd 22: inc, sc in next 17 sts, inc, sc, inc, sc in next 17 sts, inc, sc in last st (44 sts). Rnd 23: sc in each st.
Rnd 24: inc, sc in next 19 sts, inc, sc, inc, sc in next 19 sts, inc, sc in last st (48 sts). Rnds 25-27: sc in each st.
Rnd 28: dec, sc in next 19 sts, dec, sc, dec, sc in next 19 sts, dec, sc in last st (44 sts). Rnd 29: dec, sc in next 17 sts, dec, sc, dec, sc in next 17 sts, dec, sc in last st (40 sts). Rnd 30: dec, sc in next 15 sts, dec, sc, dec, sc in next 15 sts, dec, sc in last st (36 sts). Rnd 31: dec, sc in next 13 sts, dec, sc, dec, sc in next 13 sts, dec, sc in last st (32 sts). Rnds 32-33: sc in each st.
Rnd 34: dec, sc in next 11 sts, dec, sc, dec, sc in next 11 sts, dec, sc in last st (28 sts). Rnd 35: dec, sc in next 9 sts, dec, sc, dec, sc in next 9 sts, dec, sc in last st (24 sts). Rnds 36-38: sc in each st.
Rnd 39: [inc, sc in next 3 sts] repeat 6 times (30 sts). Rnds 40-42: sc in each st.
Rnd 43: [inc, sc in next 4 sts] repeat 6 times (36 sts). Rnds 44-46: sc in each st.
Rnd: 47: [inc, sc in next 5 sts] repeat 6 times (42 sts). Rnds 48-50: sc in each st.
Rnd 51: [inc, sc in next 6 sts] repeat 6 times (48 sts). Rnds 52-54: sc in each st.
Rnd 55: [inc, sc in next 7 sts] repeat 6 times (54 sts). Rnds 56-58: sc in each st.
*Update: For Rounds 59 and up there was an increase missing in the original post. There should be 6 increases – 2 at each end and one in each middle section. inc in 1st st, sc in next 11 sts, inc, sc in next 12 sts, inc, sc, inc, sc in next 11 sts, inc, sc in next 12 sts, inc, sc in last st (60 sts). Rnds 60-62: sc in each st.
Rnd 63: inc, sc in next 13 sts, inc, sc in next 13 sts, inc, sc, inc, sc in next 13 sts, inc, sc in next 13 sts, inc, sc in last st (66 sts). Rnds 64-66: sc in each st.
Rnd 67: inc, sc in next 14 sts, inc, sc in next 14 sts, inc, sc, inc, sc in next 14 sts, inc, sc in next 15 sts, inc, sc in last st (72 sts). Rnds 68-70: sc in each st.
Rnd 71: inc, sc in next 15 sts, inc, sc in next 15 sts, inc, sc, inc, sc in next 15 sts, inc, sc in next 16 sts, inc, sc in last st (78 sts). Continue to sc in each stitch until entire piece measures approx. 20” or about 28 to 30 rows. Fasten off and weave in ends. Rnd 1: start 4 sc in magic ring. Ch 2 and 4 sc in second ch from hook. Rnd 2: inc in each st (8 sts). Rnd 3: inc, sc in next 3 sts, inc, sc in next 3 sts (10 sts). Rnd 4: inc, sc in next 4 sts, inc, sc in next 4 sts (12 sts). Rnd 5: inc, sc in next 5 sts, inc, sc in next 5 sts (14 sts). Rnd 6: inc, sc in next 6 sts, inc, sc in next 6 sts (16 sts). Rnd 8: inc, sc in next 7 sts, inc, sc in next 7 sts (18 sts). Rnd 9: inc, sc in next 8 sts, inc, sc in next 8 sts (20 sts). Rnd 10: inc, sc in next 9 sts, inc, sc in next 9 sts (22 sts). Rnd 11: inc, sc in next 10 sts, inc, sc in next 10 sts (24 sts). Rnd 12: dec, sc in next 10 sts, dec, sc in next 10 sts (22 sts). Rnd 13: dec, sc in next 9 sts, dec, sc in next 9 sts (20 sts). Rnd 14: dec, sc in next 8 sts, dec, sc in next 8 sts (18 sts). Rnd 15: dec, sc in next 7 sts, dec, sc in next 7 sts (16 sts). Stuff lightly with fibrefill. Sc in each st until entire piece measures approx. 20” or about 75 rows. Fasten off and leave a tail for sewing to body. Rnd 3: inc, sc in next 5 sts, inc, sc in next 5 sts (14 sts). Rnd 4: inc, sc in next 6 sts, inc, sc in next 6 sts (16 sts). Sc in each st until entire piece measures approx. 14” or about 60 rows. Fasten off and leave a tail for sewing to body. Rnd 3: [inc, sc in next st] repeat 6 times (18 sts). Rnd 4: [inc, sc in next 2 sts] repeat 6 times (24 sts). Rnds 5-7: sc in each st.
Fasten off and leave a tail for sewing. Stuff with fibrefill as you attach to squid body. Determine what size you want the pocket based on how big your squid turns out. In my case, the pocket was approx. 8” x 10” and was triangle-shaped. 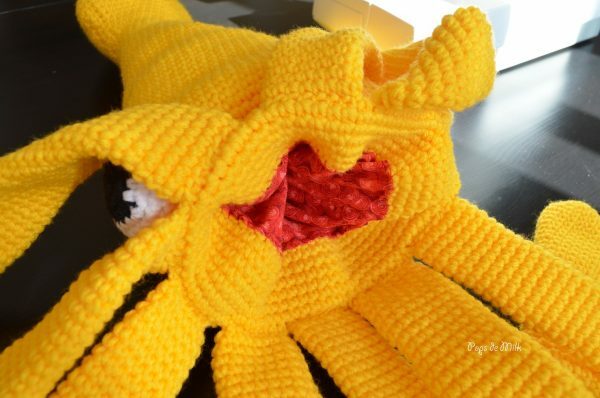 The shape doesn’t have to be perfect, the purpose of the pocket is to stuff the squid with fibrefill but still have a mouth. 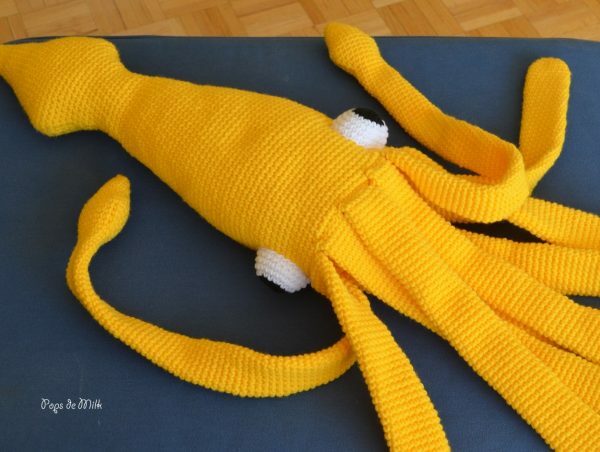 Sew lining to last row of squid body while stuffing the body with fibrefill. Once sealed, you can move the stuffing around and distribute evenly along the sides and bottom. This is awesome! Do you have any idea roughly how much yarn you used? Hi Katie, thanks for visiting my blog! I used almost the entire ball of 400g/792m acrylic yarn. The brand I used is Phentex Worsted. For Round 59 of the body, shouldn’t the stitch count by 59? Since there are only 5 increases in stitches from the previous 54 count? Thanks! For that whole section (rows 59, 63, 67, 71), each row only increases by 5, correct? Or am I reading it wrong? Good eyes! There should be 6 increases – 2 at each end and one in each middle section. I’ve updated the post and the PDF. Thanks for letting me know! When you say increase you mean put two new stitches in designated stitch right? You got it! Increase is two single crochet stitches in one stitch. Great! Once I started the pattern and read the stitch count it was pretty obvious. I am thrilled to make this for my son. He is a sea creature fanatic!! It is bizarre and wonderful that “giant squid crochet pattern” google search yielded this awesome result! Thank you again. Sorry, I am pretty sure that these changes need to be made (below). I am Working through these rounds now. Thank you so much for finding this error! It’s looks awesome. 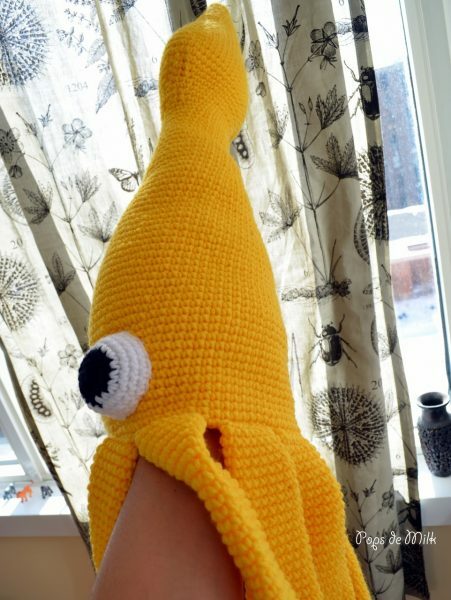 I have been struggling with my first squid hat and have changed my mind about 4 times now. :-). Thank you. 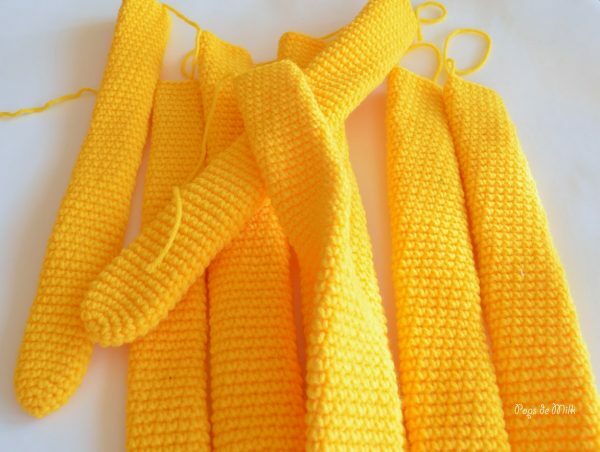 I will crochet forth until the end. It might be awesome too.